Heartworms can be deadly for chihuahuas. Heartworms are dangerous for all dogs, but especially for small dogs like chihuahuas. Luckily, heartworms are easy to prevent. Learn about heartworms and how to protect your small canine companion from these potentially deadly parasites. Heartworms are one of the most dangerous parasites that infect dogs. 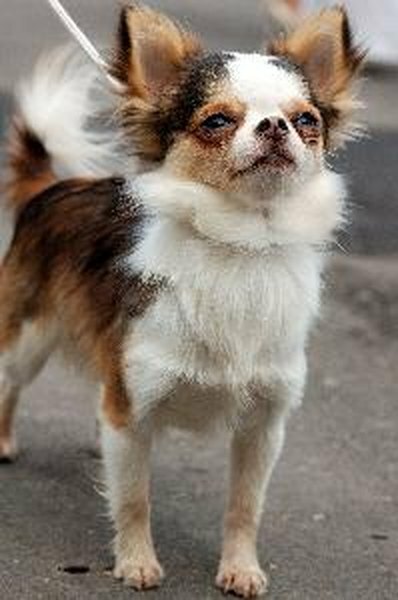 Your chiuhuahua may become infected with heartworms if a mosquito infected with the heartworm larvae bites him. The American Heartworm Society has documented the presence of heartworms in all 50 states in the US, so your chihuahua is at risk any time mosquitos are present. After the larvae enter your dog's bloodstream, they migrate to the heart, lungs and surrounding blood vessels. The larvae mature over the next four to six months, and begin releasing microfilariae into the blood. The heartworms will continue to multiply and grow the heart and lungs. Dogs with heavy heartworm infections will begin to cough and will often be lethargic. Left untreated, the heartworms will eventually fill the heart and lungs, leading to cardiac or respiratory failure and death for your chihuahua. Heartworms are easy to prevent with monthly preventative medication. Some preventatives are given orally, like Heartgard or Trifexis. Other medications are given topically, like Revolution or Advantage Multi. Many heartworm preventatives also help to control other parasites, such as fleas or intestinal worms. Heartworm preventatives require a prescription from a licensed veterinarian. For a small dog like a chihuahua, you can anticipate that the monthly cost for preventative treatment will be $10-$15, depending on the type of medication you choose. If your chihuahua contracts heartworms, seek treatment from a veterinarian. Heartworm infections left untreated are eventually fatal, and the earlier the treatment is started, the better chance your chihuahua will make a full recovery. According to Martine Hartogensis, a veterinarian in FDA's Center for Veterinary Medicine, "Treatment for dogs is very expensive and potentially toxic, requiring multiple visits to the veterinarian, blood work and x-rays, and a series of injection." If your chihuahua needs heartworm treatment, you can anticipate a cost of $600-$1200, depending on the protocol that your veterinarian follows. Do Larger Dogs Age Faster Than Small Dogs? Is Kitty Litter Toxic to Small Dogs?